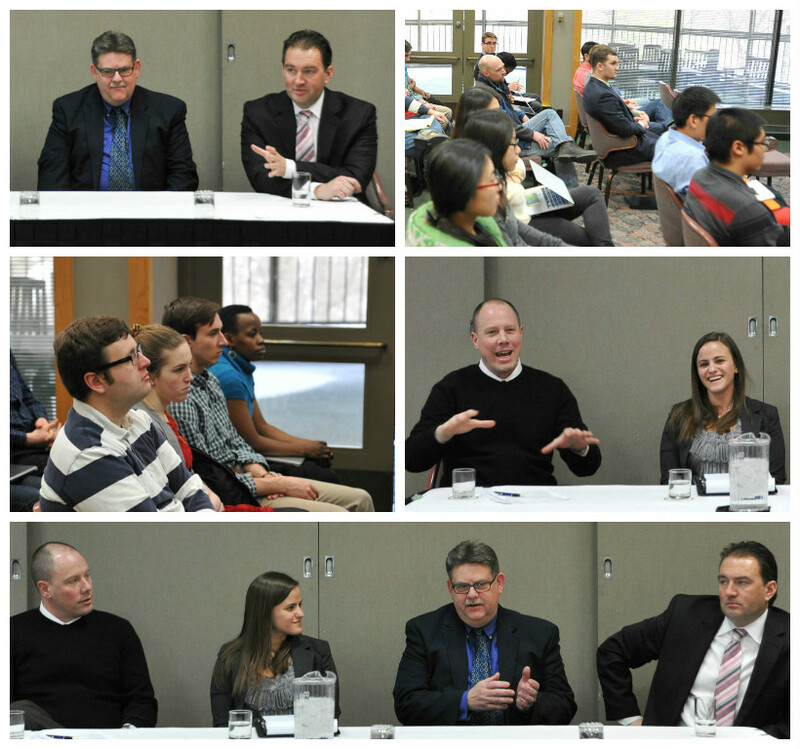 Last week the MPP program held a career panel consisting of four alumni from positions related to local, state, and the federal government. Bret Marr (MPA ’96), a lobbyist at Muchmore Harrington Smalley & Associates, Doug Lynott (MPA ’98), the acting director of the Program Administration Division of the Office of Recapitalization under HUD, Jessica Reed (MPP ’14), the Executive Search Coordinator for the Michigan Municipal League, and Al Vanderberg (MPA ’86), the County Administrator of Ottawa County, all shared some of their career advice and experience with MPP, undergraduate, and PhD students. A few themes became apparent from the panelists’ comments. One theme of particular importance to students was the significance of internships and other opportunities for making connections with potential employers. Bret Marr told the audience of a time when his squash partner played a key role in getting a position. Bret also told students to never take a “no” personally when asking your connections about potential jobs. Doug Lynott explained the opportunities that were available to him through the Presidential Management Internship and strongly encouraged current students to apply to the program, now called the Presidential Management Fellowship. Another common theme that emerged was that the panelists never set out for the positions they hold now. Each of the panelists took positions not knowing how they would fit into them. The panelists took different paths to their current position and the path was never a straight line. Students were encouraged to keep an open mind and be willing to take positions that might not exactly match their goals but would allow them to work with issues and people relevant to their ideal job. These positions could be the foundation for an ideal job or provide an opportunity to get a foot in the door and explore other possibilities. Afterwards the audience was able to interact with the panelists one-on-one, an opportunity that current student Tom Fraizer found very helpful saying, “It was a great chance to practice networking skills as well as preparation for talking to possible employers.” This put into practice one of the key themes stressed by the panelists, building and maintaining connections. Students left with new ideas on where to begin their job search and with new connections to alumni who are willing to assist their fellow Spartans in that search. We would like to thank the panelists for taking the time to participate and for sharing their experiences and insights with the audience.